The top cover is the one that I picked up from Brotherhood Books recently. The bottom cover is the edition that I owned when I was about ten or eleven, now sadly lost. 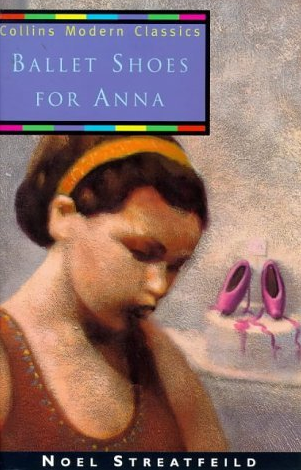 I hadn't read Ballet Shoes For Anna for many years, and only some parts of the story had stayed with me. The opening chapters, where the children are orphaned in an earthquake (very dramatic for a Noel Streatfeild novel!) 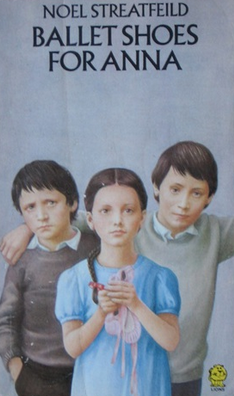 were still vividly imprinted on my mind, and the characters of the three children were as distinct as ever: conscientious elder brother Francesco, spirited Gussie, and Anna, who lives only for her dancing. The details of the boys' struggles to scrape up money secretly for Anna's ballet lessons, and Gussie's entanglement in The Gang, had faded from my memory. There was one forgotten aspect of the novel that really struck me this time around. The three orphans, children of a nomadic artist, arrive from Turkey to land on the doorstep of their conventional, pompous uncle in deepest English suburbia. 'The Uncle' cannot tolerate disruption to his routine or any displays of eccentric, 'foreign' behaviour and flies into a rage if he's crossed. Sound familiar??? Even the family name, Docksay, is not a million miles away from Dursley! I'm certainly not saying JK Rowling consciously copied this situation for her novels, and in Streatfeild's story, there is a mitigating, sympathetic aunt and no Dudley; but 'The Uncle' is such a striking figure and the experience of the orphaned outsiders being dropped into an unfamiliar, strait-laced world is poignant and memorable, the best element of the book. JK and I are almost exactly the same age and I would be surprised if she hadn't read and loved this book at the same time that I did. This was a happy trip down memory lane. I came across this while browsing Brotherhood Books and thought it was about time I gave it a go. It was a thoroughly charming story, though fairly slow to start, but the pace does pick up once the backstory of the super-smart rats begins. I was bothered by some niggles which probably wouldn't have troubled me as a child reader: like the fact that the rats are taught to read ie recognise letters and words, but it's assumed that they speak English and understand human concepts, and will be able to decipher instructions like 'take the left hand door.' 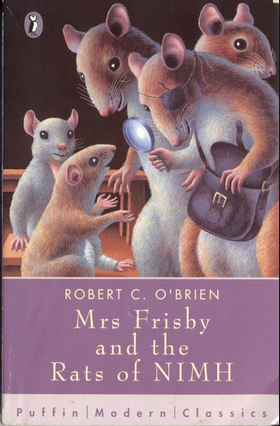 I don't know why this irked me more than the fact that all the rodents, including ordinary Mrs Frisby, use tools and take medicine! I wasn't sure I was going to enjoy this much at the start, but by the end I was completely captured. It's an anthropomorphised animal adventure, not unlike 101 Dalmatians now I come to think of it, but less witty than Dodie Smith's book. It was sweet, and the ending is ambiguous, so you can read it as terribly tragic or pretty hopeful as you choose. If I'd read this when my girls were younger, I would definitely have tried it as a read-aloud. I think they would both have enjoyed it, and there are not many books that fall into that category. 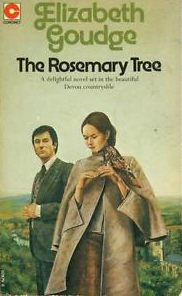 Having said that, The Rosemary Tree is not a perfectly successful book, in fact as Goudges go, it's fairly pedestrian, but it did contain lots of beautiful moments to keep me going. This was on the shelf in my parents' house, so I think my mother may have bought it once upon a time -- this edition was from 1977, so too early for me to have acquired it myself! Apparently this book was the centre of a controversy in the 1990s when an Indian author, Indrani Aikath-Gyalsen, plagiarised it for her second novel, changing the setting to India but copying the story in many places word for word. After the plagiarism was uncovered, the author took her own life. A sad shadow to hang over a lovely book. Most of the Goudge ingredients were in place -- long backstory explanations for each major character, ruminations on faith and beauty and the power of forgiveness (all things I believe in, and enjoy reading about), massive coincidences and a final neat resolution in a beautiful natural setting, this time Devon in the 1950s. Though I did quail when the lovely shabby manor house was 'saved' by being sold to become a monastery -- I don't know how long that was going to last! Elizabeth Goudge tends to set up her stories with a long introductory set up where she lovingly arranges her characters like chess pieces on her board and tells us all about their lives and what's brought them to this point; then there is a series of moves where the characters connect and collide and everything changes (generally for the better); then we're done, and the figures on the baord are left standing in slightly different orientations from before. It's not exactly plot-driven, and it's not pacy, but it's very soothing to read, and absorbing once you allow yourself to be captured by her world. I've made what seems to me a revolutionary, liberating decision, and one that goes against the advice I regularly give to writing students when I visit schools -- from now on, I'm only going to read books I enjoy. Life is too short to do otherwise. So you can expect plenty more Elizabeth Goudge book responses on this blog. A quickie read of a book that's been floating round our house for months -- I think Michael picked it up on sale somewhere on the strength of seeing Dee Madigan on The Gruen Transfer, where she is consistently smart and funny. 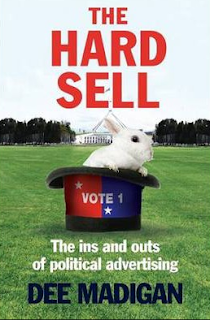 This slim book is likewise smart and funny, a brisk primer on the art and business of election advertising, quite timely given that we've just emerged from the fog of the longest election campaign in history. Written in 2014, it contains lots of stories about the 2013 election but obviously wasn't quite up to date with the very latest developments -- Tony Abbott was still PM at the time of publication. It was enlightening to hear the rationale behind a lot of decisions that have mystified me - for example, why do parties run candidates in seats they have no hope of winning? One reason is that the party's Senate candidate can piggy-back off the local candidate, and benefit from their how-to-vote cards and general visibility. There were many amusing anecdotes, like the one about PM John Howard insisting on a particular ad (about the benefits of the GST! ), even though the polling showed it wouldn't work. They duly made and ran the ad -- but only in the parts of the country where the PM happened to be campaigning at the time. A quick but enjoyable, and dare I say, educational read. Our theme for the Convent book group this month is Bullying, and Gordon Reece's Mice (2010) is our YA title. I borrowed this from the local library, whence I shall shortly return it, so that other Conventers can have their turn. I had really mixed feelings about this novel. It's a cracking read, pacy and engaging, and I raced through it. But I had a few serious problems with it. Firstly, I didn't buy the narrative voice, which sounded much more like a middle-aged man than a sixteen year old girl. Second, I was troubled by the implications of the story, which seems to suggest that empowerment and self-assertion can be most securely won through violence against others! Crime and Punishment this ain't, but it does a good job of tracing the psychological aftermath of a violent act. Lastly, and most trivially, I was annoyed by a sprinkling of typos which should really have been picked up in the proofing stage, something that publishers can't really afford to do thoroughly any more. I'll be interested to see what my fellow book groupers make of this one. It's set in the UK, but the author lives partly in Australia, so I'm counting it as #LoveOzYA. When I was younger (high school and earlier), I was a huge Elizabeth Goudge fan, but her books are difficult to come by now. I especially adored The Little White Horse (also a favourite of JK Rowling) and Linnets and Valerians, written for children, but I also read a number of her novels for adults, of which The Dean's Watch is one. Goudge is one of the authors I regularly trawl for second-hand, so when I saw this come up on Brotherhood Books, I pounced. Wow. Now I remember why I loved Goudge so much. 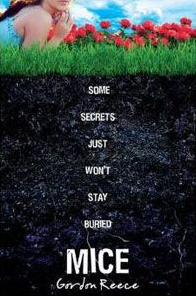 This book touched me deeply. It starts very slowly, and on the surface it's not a promising premise, essentially tracing the growing friendship between two old men -- one the proud, frightening Dean of the Cathedral in this unnamed fen city, the other a humble, cowardly watchmaker who has lost faith in almost everything. But the ripples of this tentative relationship gradually spread to encompass the entire city. It's also about clock-making, creativity, compassion, fear, love and death. Some readers accuse Goudge of sentimentality, and it's true, she does veer pretty close to the wind at times. Others will probably find her overt Christianity off-putting. But for Goudge, God is literally Love, and that's a form of Christianity I can get on board with -- in fact it might be that reading Goudge was formative in developing my own ideas about faith and spirituality. Elizabeth Goudge writes with such love and tenderness about all the things I love too -- moonlight and bells, dancing winds and candle-light, snow and stars. She makes the everyday world into something magical, and small human interactions into a facet of the divine. I sank into this book as though stepping into calm waters. Reading it was a meditation, refreshing to the spirit. This will be a book I return to till the end of my life.